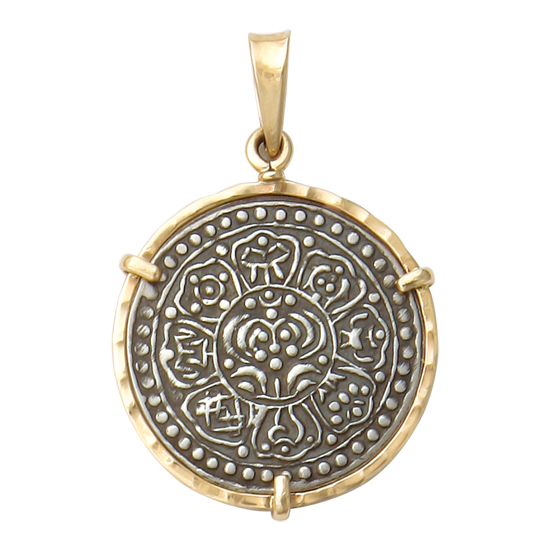 Tibetan Silver Ga-Den Thangka Coin in Handmade 14Kt Frame. Circa 1850 - 1880 AD The Thangka’s obverse shows a lotus flower within a circle surrounded by the 8 Buddhist Lucky Symbols: Chattra- Parasol; protection against all evil. Dhvaja- Banner; the victory of Buddha’s teachings. Sankha- Conch; absence of all evil. Shrivasta- An infinite knot; long life and never-ending love. 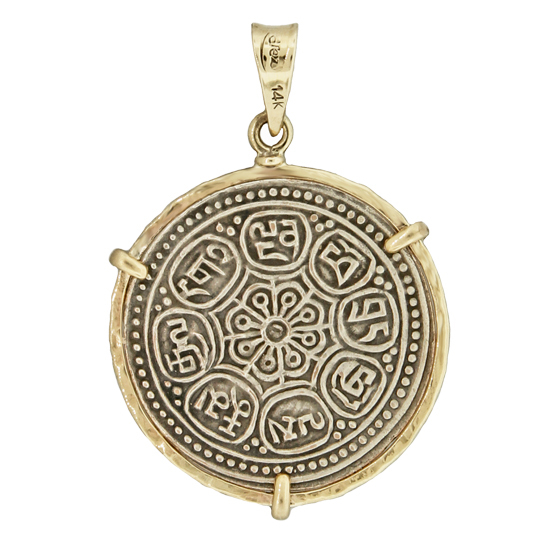 Dharmachakra- Wheel of the Law; the eight spokes represent the eight-fold path of immortality. Kalasha- vase of abundance; contains water of immortality. Matsyayugma- Golden fish, salvation from suffering, fertility. Padma- The perfect lotus; purity. The reverse shows an 8-petalled wheel/flower within a star surrounded by the legend: “dga’-ldan pho-bran-phyod-las-rnam-rgyal (The Palace of Ga-den is victorious in all directions. 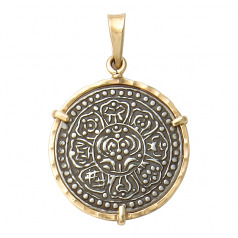 )” symbolizing the 8 pathways to enlightenment and good fortune. The legend is written in such a way as to fit into eight circles. This is actually derived from an earlier style in which the characters were inside lotus petals.